Free White Paper – SharePoint for Small Business: a viable option? Well we have been promising you a paper on the subject of SharePoint for Small Business for some time, and here it is – finally. As a small business ourselves this topic was especially interesting and we spent have spent quite some time digging in to the issues. SharePoint, Microsoft’s fastest selling server product ever, is rapidly becoming market leader in its space, and almost endemic within the enterprise and large organizations. But now, SharePoint also comes bundled with Microsoft Small Business Server and many small business owners and managers are asking themselves what SharePoint might be able to offer them. Though much has been written about SharePoint in the Enterprise, there is surprisingly little information out there for the Small Business owner looking to evaluate SharePoint. We wanted to try and fill some of that information void with this White Paper. Firstly, we wanted to dispel some of the confusion around what SharePoint actually is, and what a Small Business might be able to do with it in practical terms. Even Microsoft are pretty vague when they try to define what exactly SharePoint is. Whilst a SharePoint specialist consultancy might be able to unravel the complexity for a client, and help them to understand how SharePoint can work for them, a small business might find that their local IT support firm just don’t have the specialist SharePoint knowledge needed to help them in this area. Secondly we wanted to address the issue of cost. Cost is important to all of us now, but for Small Businesses it can be a key driver in the decision making process. 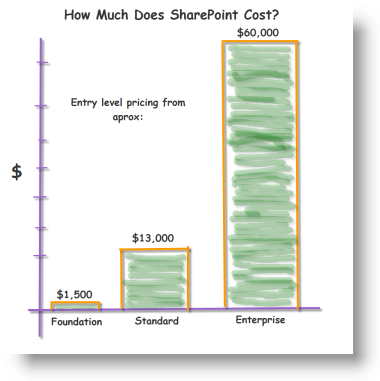 There is a popular misconception that SharePoint Foundation is a “free” product. This is simply not correct. We wanted to give Small Businesses an idea of the costs that they might incur if they choose to deploy SharePoint. Finally, we wanted to explore the issue of control. The big win for Small Businesses deploying SharePoint, in our opinion, is the degree of control it can give them over managing their own IT infrastructure. SharePoint has been designed as a platform on which ordinary business users – with no IT developer training – can build and manage their own business applications, to improve the delivery of daily tasks and business processes, like order processing, resource management and project planning. This is the kind of flexibility that small businesses need to maintain the speed of response and agility which are often our key competitive strengths. The White Paper is free to download from our website. We hope the paper will help you decide whether SharePoint is the right platform for your small business.